Carpenter ants are named because of their tendency to build their homes inside of dead trees. Unlike fire ants or most ant species, they tend to build their nests in trees instead of underground. That being said they can have underground networks around the main colony. However, carpenter ants cannot tell the difference between forest wood and the wood for your house. When they mistake your house for a dead tree you can get into some big trouble. What do carpenter ants do? 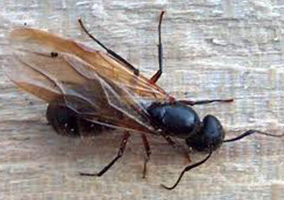 Like any other species of ants, bees, or wasps, carpenter ants operate on a hive caste system. This means that they have a hierarchy where each ant plays their own specialized role. The head of this hierarchy is the queen, with worker ants (major, medium, and minor) on the bottom. The worker ants are the ones who scavenge areas, either for food sources or new places to nest. Once they find these they’ll leave a scent trail (pheromones) to let other ants know there’s food/nesting. If this nesting area is your house then you’ll have some structural damage. If there are carpenter ants in your home they will gnaw through your woodwork, creating frass. Frass is like sawdust, but carpenter ants make it. When you have a carpenter ant infestation look closely by the woodwork of your house for this frass. One of the more obvious signs are the carpenter ants themselves. Even though they mostly forage at night, they can be active during the day. They are mostly attracted to sweets and fats, so keep an eye out! If you see any ants it could be a sign of a bigger problem at hand. What do I do if I have a carpenter ant infestation? Do not fret if you have a carpenter ant infestation, here at Master’s Pest Control we’ve had our fair share of run-ins with the pest. We have a handy guide to carpenter ants, their habits, what to do in case of infestation, and how to prevent infestation. The best thing to do if you have an infestation is to call the professionals. Here at Master’s Pest Control, we’ve been dealing with pests for 30 years. We’re a family owned and operated business, so you know you’re getting quality and personal business. Contact us at 845.856.2024 or by visiting us at https://masterspestcontrol.com/contact/.